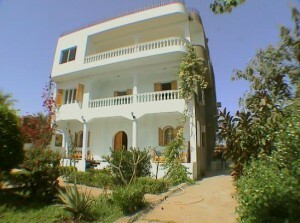 In addition to our guesthouse we have an opportunity to accommodate you on a rather long-term basis in our beautiful villa close to the river Nile and yet centrally located in the village. 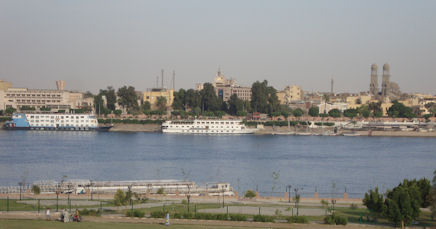 It is just a 5 minutes walk from where we live and about 3 minutes walking to the ferry boat, which brings you to the East Bank and the Luxor Temple. 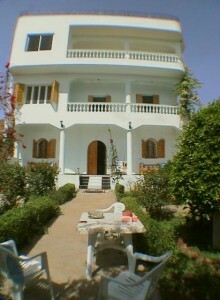 ‘The Villa’ as we all call it is built in 2002 and accommodates three spacious apartments. The roof is equipped with sun-shaded areas, a kitchen and bathroom and all you need to spend long days sunbathing. The apartments include three large bedrooms, an equally large fully equipped kitchen with a little balcony, a spacious bathroom with bath-tub and shower, a living and a dining room and a big balcony area. The floors are all tiled, the bathroom marbled, there are fans on the ceilings in every room and A/C in the living room area. On the roof you have a beautiful view. Your view to the East reveals the Nile and the city of Luxor, with the Luxor temple and the corniche right in front of you. Not less spectacular is the view to the West; Thebes spreads on the horizon behind the village and you can see Hatshepsut’s temple built into the rocky scenery of the Kings and Queens last resting places. Behind the villa there are huge fields with mango trees. These apartments are for rent not less than on a monthly basis, but shorter periods are discussible too. Long-term renting requires a contractual agreement. 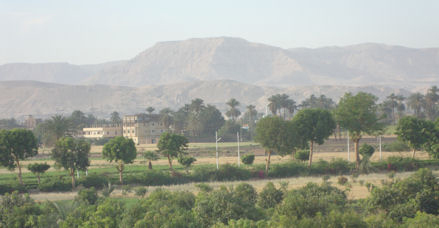 If you decide to spend all year or part of the year in Luxor, this is the perfect place to be. Ask for the rent possibilities.